This is a new series. This is as simple as it gets. About books given to me by people who are close, were close and those who have the potential to be close. There is something about gifting and receiving books as gifts. They are forever etched in your memory basket and will not go anywhere for a very long time. It is almost like they are there, in your face, whether you like it or not. Books last. The people may not sometimes – in your life or otherwise and that is why the books gifted to me will remain so special, even if the givers aren’t so special anymore. I start this series with the first book gifted to me, whose memory is sharp and vivid and just there. I must have been about eight, I think. 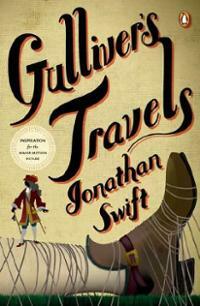 I was gifted “Gulliver’s Travels” by Jonathan Swift by my Phupha, who loved reading. I did not really know what to do with this book at eight. I was just beginning to get to classics and perhaps this was not the right one for me at that time. But the book stayed with me and of course still does. My Phupha was most instrumental in my reading, besides my Mum and Dad. We would talk about books and reading, though for most time, I was only scared by him. I read the book when I was thirteen and that too because we had a story about his travels in school. That is when I truly understood the book – with all the satire and the plot. It is not one of my most cherished classics, but I will always remember him and his kindness in encouraging a lost boy, who did not understand sports to read. To help discover himself a little. Thank you Phuphaji. Hope you are in a great place. This entry was posted in Books Given To Me and tagged Books Given to Me, Gulliver's Travels, Jonathan Swift on February 26, 2014 by thehungryreader.